As we have been struggling financially for a while, I decided to save money this winter by installing a wood burning stove in our basement. I found a 55 gallon barrel, scavenged cinder blocks and ductwork from ditches and dumpsites, and with a $50 kit converted the barrel into a stove. I mortared the blocks together with clay from my yard and ran the ducts into our heating system. It is utilitarian, stuck in our basement with our washer/dryer, fusebox, unfinished ceiling and walls, and storage units, so I let it be an uncouth affair. It has served us well with free wood which is always available in these forested hills. 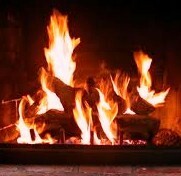 As I build each fire and stoke it through the day, I have gradually spent more and more time just watching the flames. In my boyhood, the hearth was a spot of peace and calm. It was simply for our pleasure, so we lit it only when we had leisure time and a desire to sit in quietness. Childhood emotional memories are deep rooted, and I find that sitting by the fire now is healing, soothing. At first I sat leaning against a paving stone on the cement floor, but I eventually dragged a recliner into this storage room, and here I sit, listening to the steaming, popping, and crackling and watching the orange dancing glow, art in motion. I’d like to ask my readers, what was peaceful and calming for you as a child? Would you share it with us? When I was young, peace was found out in the woods alone. I learned to sit sometimes so still and quiet that the animals forgot that an intruder had invaded their space. I’ve had rabbits come out and hop right past my feet in the quietness. I guess there was something safe about being in a place that required no answers and seemed to hold no judgment. Joel, that sounds like a very good place to be. I also found a lot of comfort (and still do) wandering alone through the woods… though after getting married, it feels more lonely by myself outdoors than when I was single. Kelly, I love the snow too! So glad we got one good snow this winter (today!). I would climb a tree and sit in a secure (!) spot overlooking my backyard and the neighborhood. It felt high and removed and peaceful.- which I suppose is where I wanted/longed to be emotionally too. Don’t think I realized that until I just typed that out. To make me ‘safe’ – my father cut my access limb so I could not climb up the tree anymore. Now I realize more fully why that mattered to me so much at the time and why I still feel the pain of that loss. Thanks anonymous! Interesting contrast between inward and outward safety (and which is more important to us!). My escape to solitude was usually up a tree as well. There was no shortage of mango trees where I grew up and they are all good for climbing, so it was easy to find one where I wouldn’t be disturbed. The other place I enjoyed solitude was in a dug out canoe on a lake near by where you would almost never see a motorized boat. Very quiet and peaceful. Sounds very peaceful. Trees seem to be popular kid spots. My wife Kimberly had a favorite tree as a child until it was cut down. My family was large (16ppl!) and we lived in a very small home. My peace and comfort was usually found in a private spot, typically a small space somewhere (in the closet, against the wall, underneath the hanging clothes, for instance). To this day, I am drawn to closet-sized nooks for ultimate peace and calm. I know how you feel! I laid out a bed for myself in our utility room closet floor (with the lowest shelf about 3 feet up). I thought it was great.